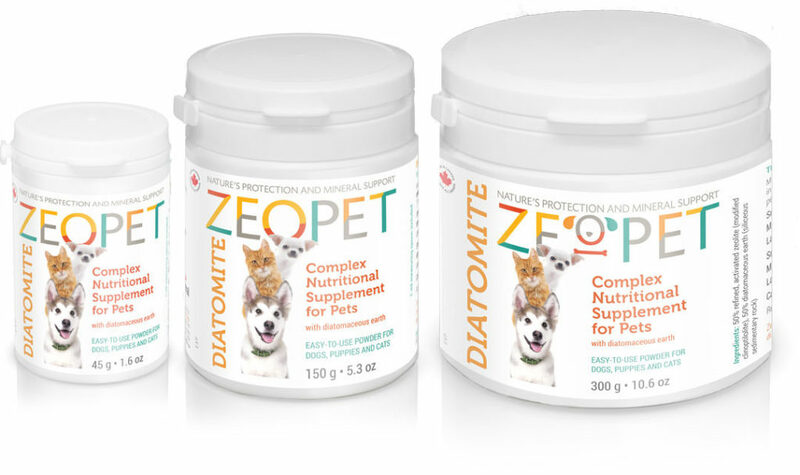 ZeoPet Diatomite for Pets (universal grind and mineral content) is a complex nutritional supplement for dogs and cats of all breeds. Improvement in the digestive system and the general cleansing of the organism from parasites and organic toxins. Strengthening of the immune system, as well as increased resistance towards certain diseases, including those caused by bacterial infections. Normalization and enrichment of the mineral balance — the results of which can be visible through the improved quality of fur and condition of the skin, claw structure, and color intensity. Improved state of the teeth, cartilage, bones, fur, and general well-being/vivacity of the animal as a result of the diatomite’s partial transformation into a biologically active form of orthosilicic acid. Removal or significant relief of allergic reactions (often related to bacterial allergens or parasites). Prevention and protection of the animal’s liver and kidneys from consequences that may arise as a result of mineral imbalance and toxic impacts of low-molecular free radicals and biological toxins. Improved functionality of the cardiovascular system due to the strengthened vessels and up to a 30% reduction in cholesterol levels, as well as a reduced risk of forming parietal cholesterol plaque. In combination with its mineral components, zeolite’s effect as an efficient sorbent (cleaner) improves not only the digestive system and the quality of fur, nails, and teeth, but also enhances the animal’s overall health and well-being. Mix the nutritional supplement with food immediately before feeding once a day in the following proportions: 1 g of nutritional supplement (1 measuring spoon) per 1.5-2 kg of body weight for 4 weeks.